Not only is Mountain View Innovation Centre the home of business innovation in the Isle of Man, it is also available as one of the most exciting venues on the Isle of Man too! Originally developed in 2001 as Island Studios, and recently given new investment and extensive refurbishment, Mountain View provides several venue opportunities. Conceived as a vast Sound stage for filming, our 1042m2 (11,200 sq ft) - 14.3m (47ft) tall Studio One is ideal for large scale indoor exhibitions or any large-scale event where protection from the elements is desirable – and can accommodate over a thousand people. The large warehouse-type building has a huge roll-up door allowing drive-in vehicle access (which would accommodate even high-level trucks and double decker buses!). The room is also fully equipped with ample power, lighting and a fire-sprinkler system. Perhaps you can envisage a motor sport display or staging area for the famous TT races or Manx GP, or a trade or cultural exhibition. 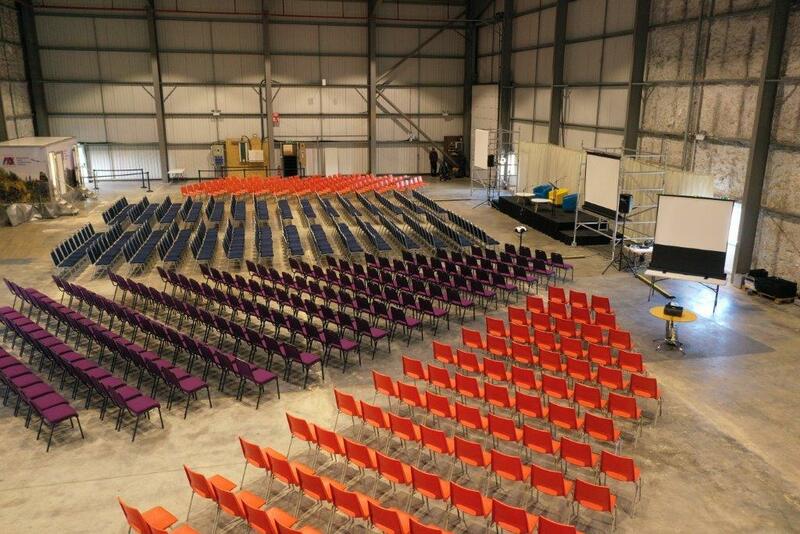 Studio One is the largest and most flexible venue of its type on the Isle of Man. Capacity – up to 1000. Available in a wide variety of layouts. Full fire sprinkler system and high capacity power provision (additional costs may apply). Adjacent to Full Catering Service in Babbage’s. Our smaller 260m2 studio / workshop was purpose built for in house set production but is now available for hire. With direct links to Studio One, Babbage’s incorporates a smaller venue for up to around 180 people with a full commercial kitchen and cafeteria section itself accommodating around 40 people. Babbage’s is perfect for kids or adult birthday parties, wedding receptions, informal seminars, presentations, charity, corporate or seasonal events. Babbage’s can be presented in various layout styles such as theatre, classroom, cabaret, large meal tables, cafeteria or seminar. The main Babbage’s Venue is equipped with state-of-the-art audio-visual systems, including a large 24:9 Touchscreen and video relay system with flexible audio and video input facilities. The ground floor of the complex is fully Accessible for those with mobility impairment, with Accessible wet-room including shower, and the venue has a full induction loop included in its sound system for those with hearing impairment. Capacity – up to 180. The Babbage’s cafeteria is ideal for small social gatherings, formal and informal meals, or for smaller meetings of up to around 40 people, or its three bi-fold doors can open out the space to become part of the main Babbage’s Venue. Capacity – up to 40. 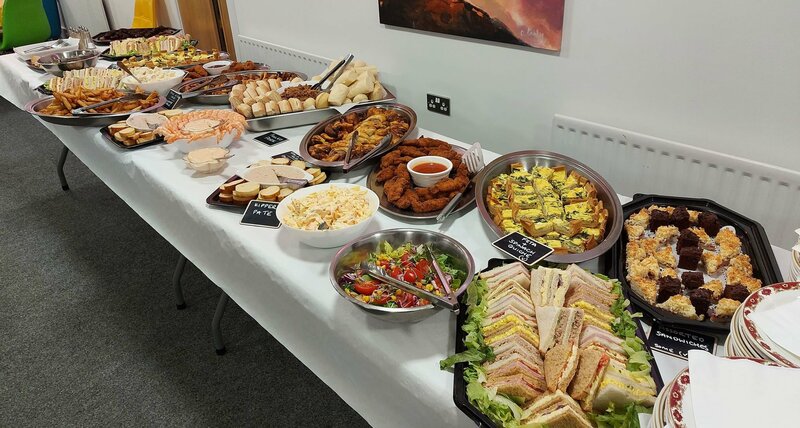 Light lunches or regular refreshment breaks can be catered for in both the Faraday Suite, Newton Suite and Small Meeting Room, please contact us for more information. High Quality Self-Contained Mobile Toilet unit for hire – just add power (or generator). 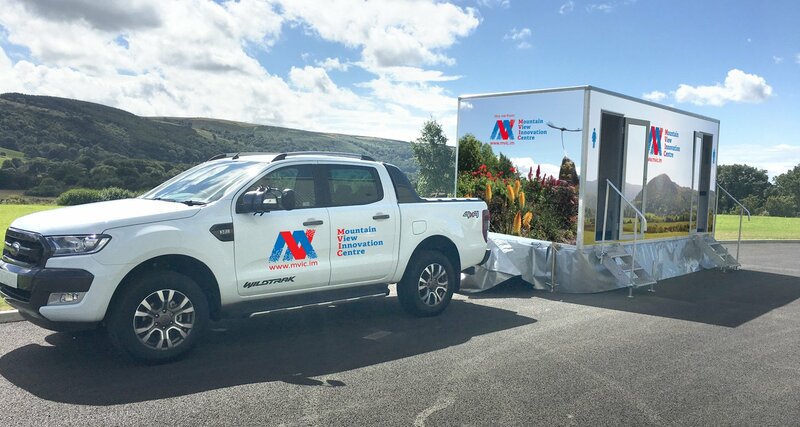 This top-of-the-range mobile unit raises the standards of temporary toilet accommodation, without the need for mains water supply or drainage. Our facilities are light, spacious and stylish. Our Lavish Loos are the latest top-of-the-line model with 5 star contemporary interiors to match. They look, feel and are…spotlessly clean in every sense. Exactly what you should expect of luxury mobile toilet facilities for your prestige event. Our Lavish Loos are ideal for high-profile corporate and private events, with contemporary styling including variable-colour feature-lighting and even music speakers. The unit needs a space just 25’ x 8’ (7.6 x 2.4m)* to provide three ladies’ WCs, plus one gents’ WC and three urinals, with two stylish washbasins in each. 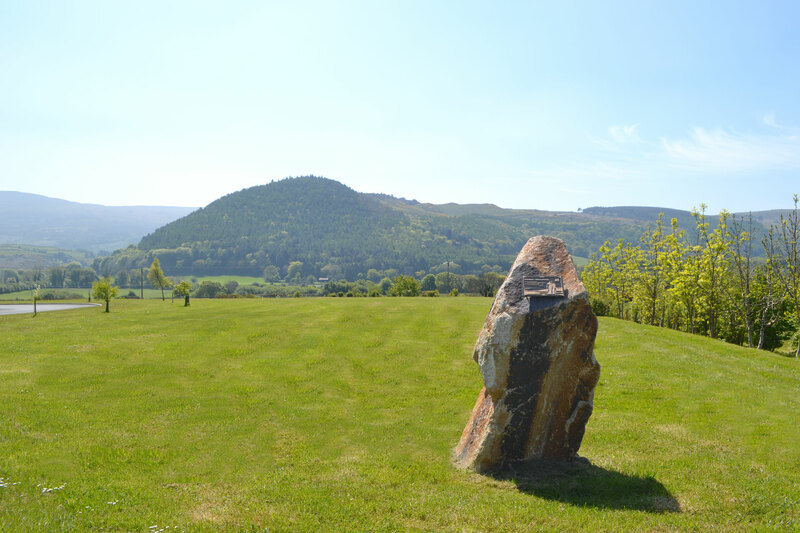 Step outside Babbage’s onto The Lawns - up to 25 acres of private land with breath-taking views of the surrounding countryside. This carefully maintained parkland garden is perfect for that special occasion. Erect a marquee, have a feast from our restaurant and enjoy this peaceful, idyllic location to celebrate your special day. The Lawns are also ideal for extending your indoor event outside! Outdoor power and water hook-ups are available, so whatever your needs, we will endeavour to meet them! Capacity – up to 25 acres. High Capacity Power and Water Available. The Faraday Suite is a modern, light, airy room equipped with air conditioning, heating and is enhanced by natural daylight. This room is ideal for corporate informal or formal gatherings, teaching seminars or board meetings. It also benefits from Wi-Fi and private kitchen and toilet facilities. 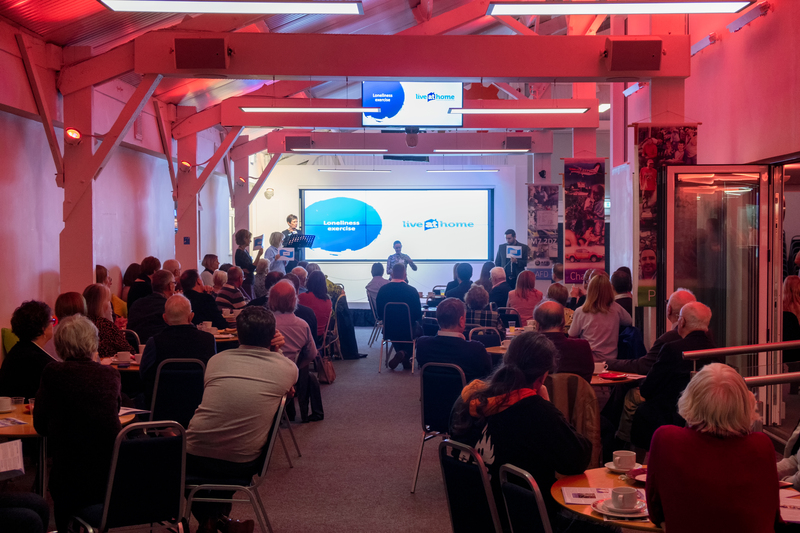 With a capacity of up to 60 people, the room can be laid out in various styles such as boardroom, classroom and theatre. Video conferencing is also available along with the use of a 60” smart TV with built in Wi-Fi, HDMI & USB connectivity and mobile screen mirroring. A whiteboard is also available on request. Capacity – up to 60. Available as boardroom, classroom, seminar room layout. Private kitchenette and toilet facilities. The Newton Suite is a fresh modern room with feature floor to ceiling glass windows creating a wonderful feeling of space and light. 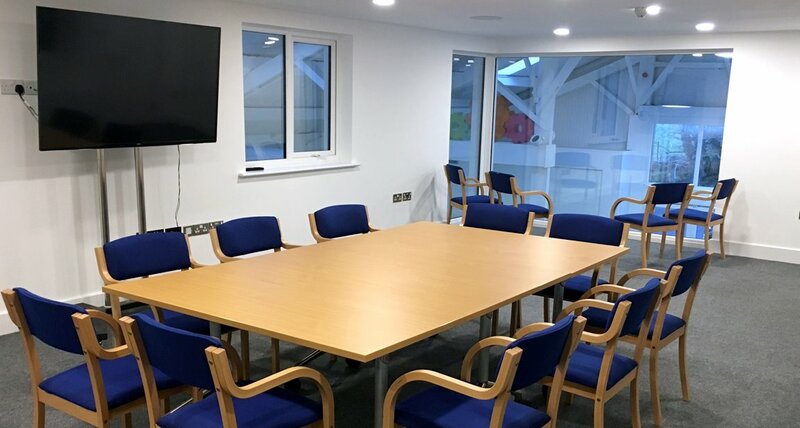 This room is ideal for corporate informal or formal gatherings, teaching seminars or board meetings.. With a capacity of up to 40 people, the room can be laid out in various styles such as boardroom, classroom and theatre. The newly refurbished Newton Suite is ideal for small events of up to 40 people including meetings, seminars and meals. Video conferencing is available along with the use of a 60” smart TV with built in Wi-Fi, HDMI & USB connectivity and mobile screen mirroring. A whiteboard is also available on request. Our Small meeting room has a capacity of around 8-10 people and also benefits from Wi-Fi. 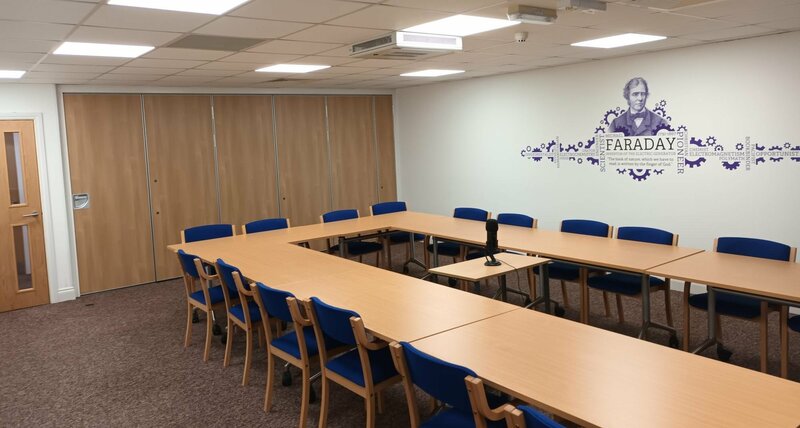 This room also has an optional whiteboard and TV with a HDMI connection and the use of a shared kitchen and toilet facilities. Capacity – up to 8 (Boardroom), 12 (Seminar). Shared kitchenette and toilet (including accessible toilet) facilities.